(NaturalNews) Dozens of people in Japan have contracted a potentially deadly illness that hasn't been seen in the country for nearly 70 years. Reports indicate that visitors to Yoyogi Park, one of Tokyo's most popular leisure spots, have been falling ill with dengue fever, a mosquito-transmitted illness that mostly occurs in the more tropical regions of Southeast Asia but now appears to be on the move. Local officials closed the park after some 55 people, according to USA Today, fell ill with the disease, which can lead to severe fever, joint pain and chronic headaches. In more extreme cases, dengue can cause persistent bleeding that, in a worst-case scenario, results in death. The last time dengue hit Japan was in 1942, when an epidemic broke out in the Nagasaki-Sasebo region of the country. The origin of the resultant string of infections, which lasted until 1945, is believed to have been sailors who fell sick during a long voyage, upon which they brought the disease back to their home country. Fast forward 69 years and dengue has suddenly reemerged, seemingly out of nowhere. A teenage girl was the first to contract it, according to The Telegraph, followed by many others, including Saaya and Eri Aoki, two glamor models, have since gotten it. All of these individuals are said to be in stable condition, but officials are warning that anyone who develops a fever after being bitten by mosquitoes should seek medical assistance. Though it isn't contagious, dengue can spread very quickly when a mass of mosquitoes transfers it to humans in a densely populated area. Dengue also has no known cure, so patients who contract it have no choice but to let it run its course, a painful process that some say is truly indescribable. "My head hurt so bad that I wouldn't wish it on my worst enemy," stated Jeanette Potter, a New York woman who contracted dengue back in 2010 during a vacation to Key West, Florida, to CNN. "Your bones just hurt. That's why it's called breakbone disease. It's indescribable. I can't even articulate the crazy pain that you're in. You feel like you're heavy and out of your body." Since the outbreak, more than 200 gallons of insecticide have been sprayed at Yoyogi Park, and officials have put up signs warning visitors to wear long-sleeved shirts and pants to avoid being infected. But the real push will probably be for people to be jabbed with experimental dengue fever vaccines, or for governments to begin releasing genetically modified (GM) mosquitoes in problem areas. The British firm Oxitec has already begun releasing its own GM mosquitoes in places like Panama and Brazil -- and soon to be India -- with claims that these transgenic critters will successfully weed out all the wild mosquitoes carrying the disease. The problem with this, as we previously pointed out, is that releasing these unnatural species poses irreversible risks to the planetary ecology. Then there are the vaccines, which conveniently await commercial release at just the right time when dengue epidemics are in full swing across the globe. Even these, admit experts on the subject, may not even work, and will probably cause an initial increase in the spread of dengue, at least for the first few years. 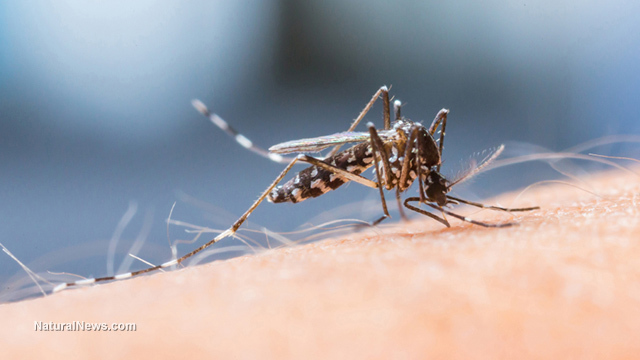 "Our analysis suggests that if we develop and widely use a vaccine for dengue fever, there may later be spikes in the incidence of the disease that are two to three times higher than its normal level," stated Jan Medlock, an expert on the evolution and epidemiology of infectious disease and an assistant professor in the Department of Biomedical Sciences at Oregon State University.